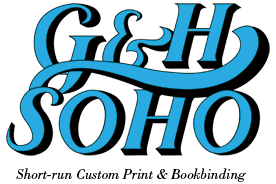 G&H Soho has been in the digital print industry for over 30 years, and we attribute much of our long-running success to our quality print standards. We specialize in black only, two color and full color printing. We pride ourselves on our ability to be problem solvers. Unlike other printers, if you have a book with 5 color pages and 150 black & white pages, we will charge a color rate for the color pages and a black & white rate for the black only pages. Our motto has always been Your Book Your Way! We make it our goal to provide a quality product at a reasonable price.